We have a tradition in our house. A tradition passed down from my parents. A tradition that I’m now passing down to my kids. A tradition known as, Friday Pizza Night. Growing up, this tradition involved take-out pizza from the closet pizza delivery spot. Sometimes the wait for our Friday night pizza could be hours long, but it was always worth it. I’m not sure if the pizza was really that special or if the tradition of getting pizza every Friday night made the wait worth every minute. After turning to real food, I realized most take-out pies aren’t made with the best ingredients. Ignorance truly is bliss (well, until your stomach and head start telling you otherwise–which is usually the case with overly-processed food). Just because we had resolved to avoid processed food, didn’t mean we couldn’t keep my family’s Friday night tradition alive. I knew the solution: making pizza at home, in my own kitchen, where I could use the very best ingredients. There was only one slight problem. At the time, I didn’t exactly know how to cook anything that didn’t come from a box or package. My first homemade pizza tasted and felt more like cardboard than actual food. My next few attempts were just as bad. Finally, one night, after being served one too many brick-like pizzas, Dustin pleaded, “Why don’t we take a break from pizza for a while.” For someone as stubborn as myself, that just wasn’t going to happen. After a bit of research about how to make edible homemade pizza, I attempted to make pizza again. That night, I made a completely edible pizza. In fact, it was more than just edible, it was incredible! The crust was crispy and soft. The cheese was melted with a few brown patches, and the sauce was seasoned just right. My family’s tradition could live on, homemade style. Pizza night is now a family affair. The kids scoop and dump the flour into the designated bowl and then roll out the dough, stealing little pieces of dough after each roll, and Dustin shreds the cheese. At this point, I’ve been appointed to head pizza supervisor, which means I heat the oven, warm the baking stone, and make sure the kids don’t completely devour the raw dough. On Friday night, I’ll occasionally share a pizza-making picture or video via Instagram Story. 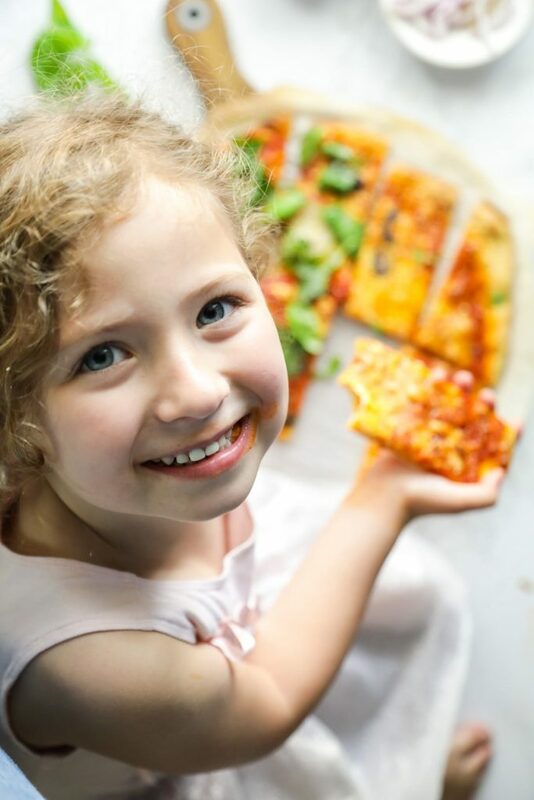 Each time I share a homemade pizza creation, I receive questions about the einkorn pizza dough recipe used to make the crust. Most of the time, I refer reader friends to a pizza dough recipe originally published on the blog in 2013. In that post, I shared my recipe for whole wheat pizza dough, which I just updated last year with a note at the bottom to include instructions on making einkorn pizza dough. 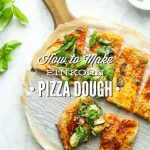 It’s a bit hard to read through that post and then read through the einkorn notes at the very bottom, so I thought it would be helpful to write a brand new post about making einkorn pizza dough. Einkorn is known as the oldest variety of wheat, making it an “ancient” grain. The ancient grain is believed to have originated in the Tigris-Euphrates region and is possibly the main grain referenced in the earliest accounts of the Bible. To put it simply, einkorn is the wheat men were eating in the earliest days before modern-day wheat varieties. While modern wheat has undergone hybridization, einkorn still holds true to its original properties. The sweet, ancient grain has a lighter texture and taste than modern-day wheat, and contains a more favorable gluten ratio. People with minor gluten sensitives may be able to consume einkorn without the issues associated with whole wheat due the lack of D-genome; however, einkorn is not gluten-free. All-purpose einkorn flour looks and tastes similar to white flour, so it’s the perfect flour (in my opinion) to use when making pizza dough. Einkorn is sold in some health food stores and online. Einkorn does act a bit different than whole wheat when it’s used in baked recipes, so it does take some time to get used to this flour. 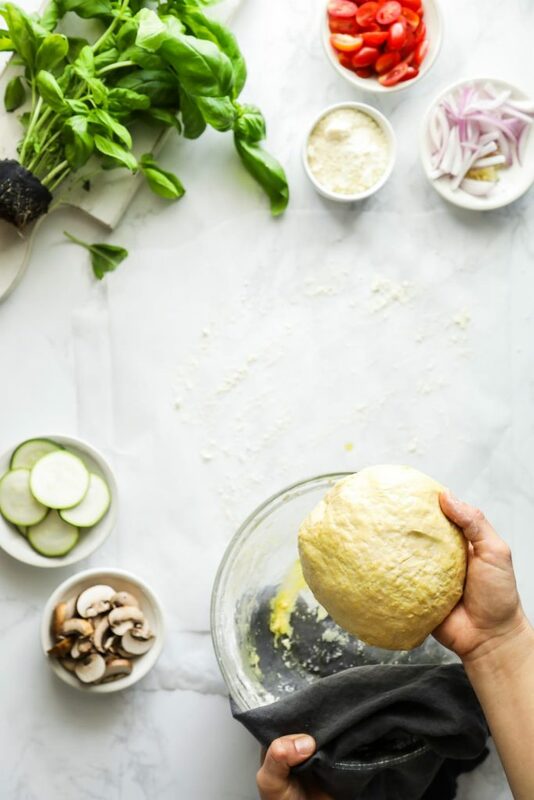 One of the biggest differences between whole wheat and einkorn is the amount of kneading time needed to create yeast doughs, like pizza dough. While whole wheat requires endless kneading (at least it feels that way), einkorn is more of a hands-off dough. This makes einkorn flour one of the easiest flours to use for yeasted breads, including pizza dough. 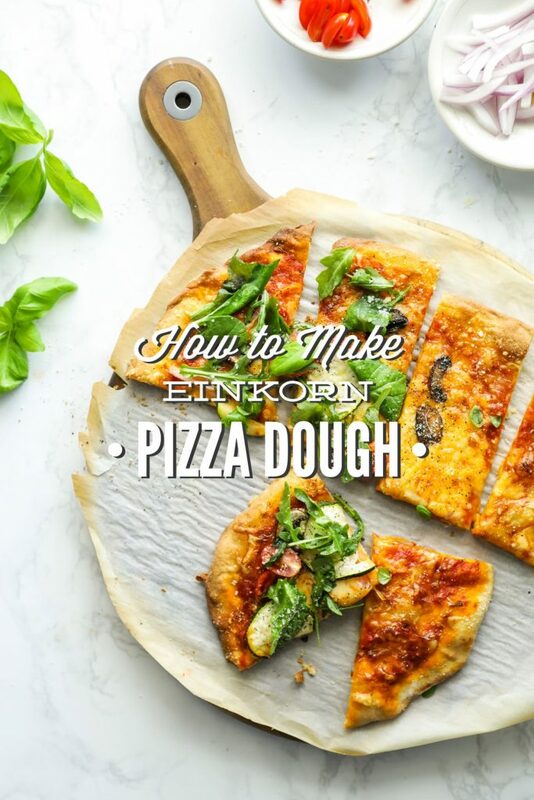 Einkorn pizza dough can be made in advance and kept in the fridge (about a day or two) or freezer (a couple of months) until needed. The dough may be used to make traditional, baked pizza or turned into grilled flatbreads (my favorite during the summer months). The final baked crust has a light and favorable taste and a crispy crust. 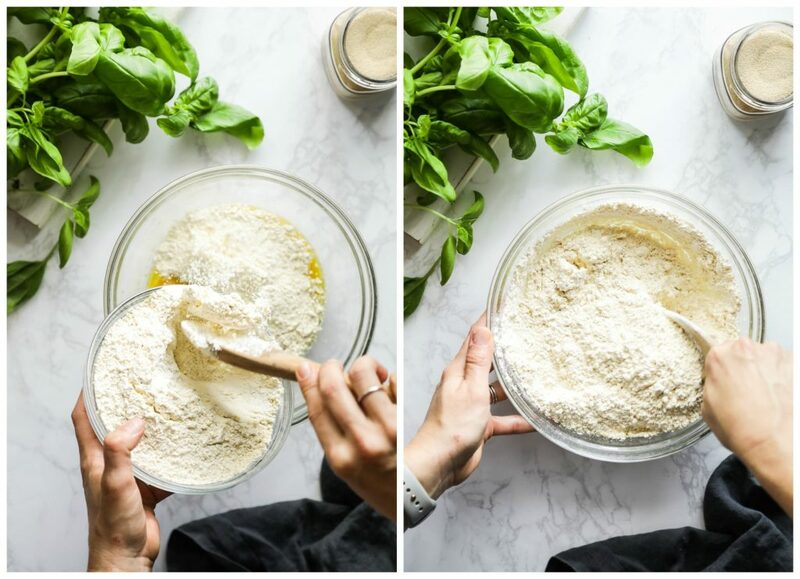 An easy-to-make homemade pizza dough made with all-purpose einkorn flour. In a large mixing bowl, sprinkle the yeast over the water. After about 5 minutes, whisk the mixture. 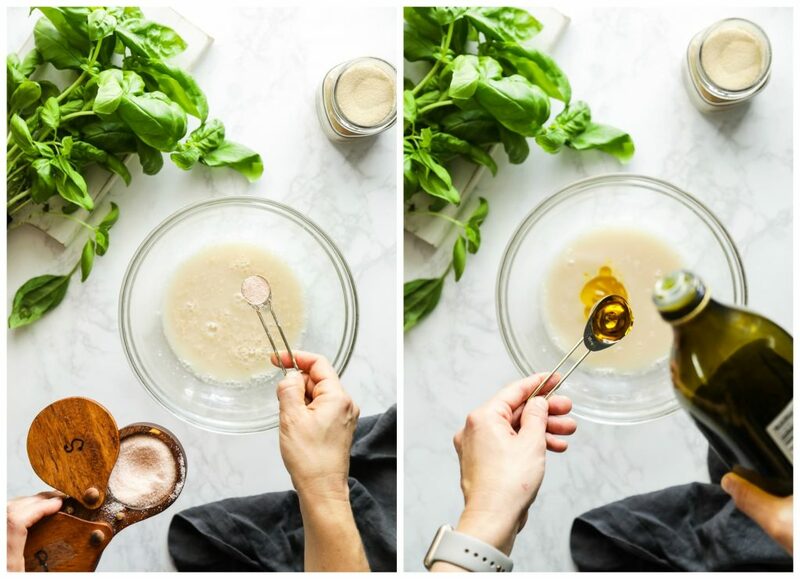 Add the salt and oil, and whisk again to combine the ingredients. 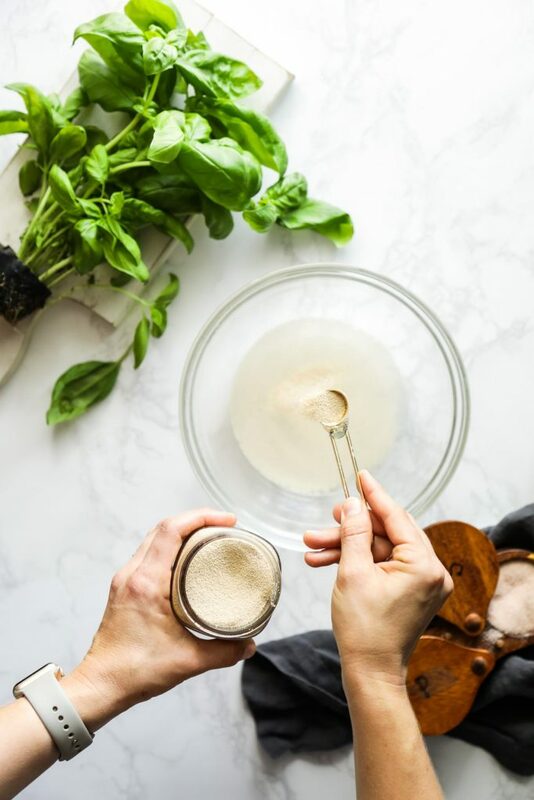 Using a wooden spoon, stir the flour into the wet ingredients, until it becomes hard to use the spoon (at this point, you'll have a bit of a floury dough with flour still in the bowl). Gently knead the rest of the flour into the dough. There's no need to continue kneading the dough once it has formed a ball. If you'd like to use a stand-mixer, such as a KitchenAid Stand-Mixer, use the dough hook on your mixer. Knead the ingredients with the dough hook until the dough has formed a ball. If you continue to knead once the dough has formed a ball, the result will be a very sticky, unpleasant dough. 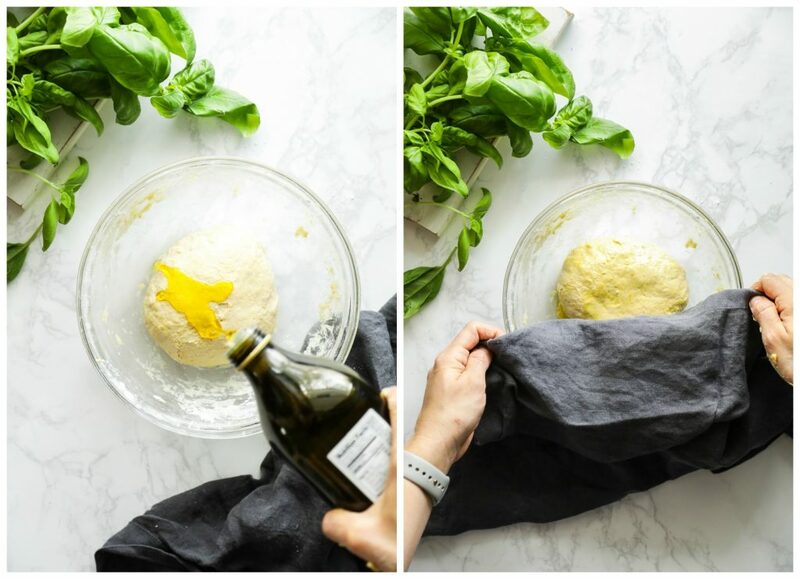 Drizzle the dough with a bit of olive oil, spreading the oil over the dough with your hands. Cover the bowl with a towel. Rest the dough, at room temperature, for about an hour. The dough won't significantly double in size. After an hour, preheat the oven to 475F. Place a large baking stone, or two medium-size baking stones, in the oven to preheat. Dust a large sheet of parchment paper with einkorn flour. Transfer the dough to the parchment paper. If you're making one large pizza, you'll want to use all the dough. If you're making two medium pizzas, divide the dough into two balls, placing one half on the parchment and the other to the side (you'll also need another piece of parchment for the second half). Roll out the dough on the parchment paper, using a rolling pin or pressing the dough out from the center with your hands. Einkorn pizza dough can tear easily, so don't roll it too thin. Brush a small amount of olive oil over the top of the dough. Add the desired toppings over the dough (sauce, cheese, veggies, meats, etc.). 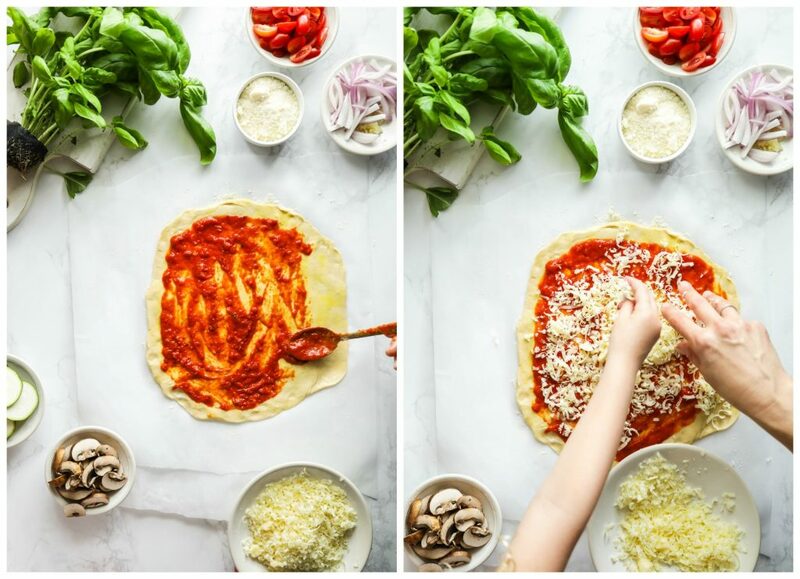 Carefully pick up the parchment paper, and place the parchment and pizza on the hot baking stone (in the oven). It's helpful if you have an extra person available to help you pick up the parchment. Bake the pizza for 12-15 minutes, until the crust is golden brown. Allow the pizza to rest for 5-10 minutes before slicing. To make individual grilled flatbreads, preheat an outdoor grill to roughly 450F (preheated for about 10-15 minutes on a high flame). Dust a large sheet of parchment paper with einkorn flour. Divide the dough into 4-6 small balls, and then roll each dough ball out to create a small flatbread. 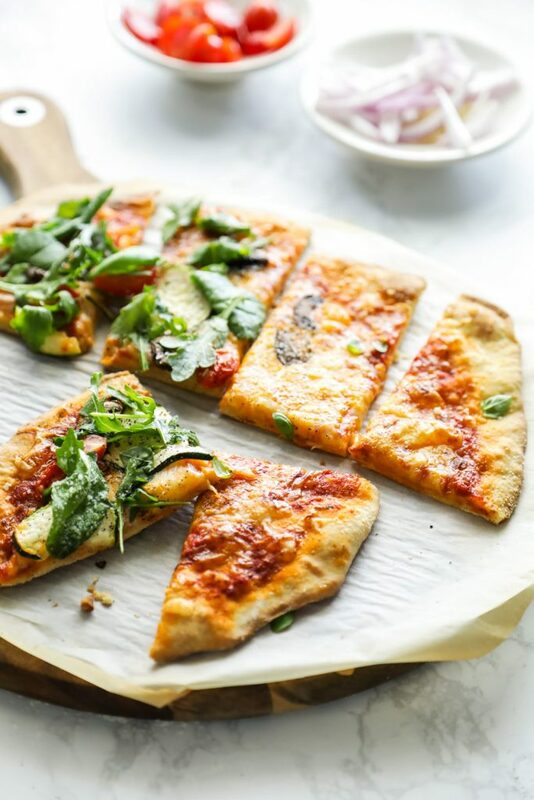 Einkorn pizza dough can tear easily, so don't roll the flatbreads too thin. Brush a small amount of olive oil over the top of each flatbread. Once the grill is hot, work quickly to place the dough on the grill. Cook the flatbreads for about 3 minutes, with the grill covered, until the bottom of the dough easily lifts away from the grill and grill marks are apparent. Use a heavy spatula to get under the flatbreads and flip them. Cook the flatbreads, with the grill covered, for another 2-3 minutes. 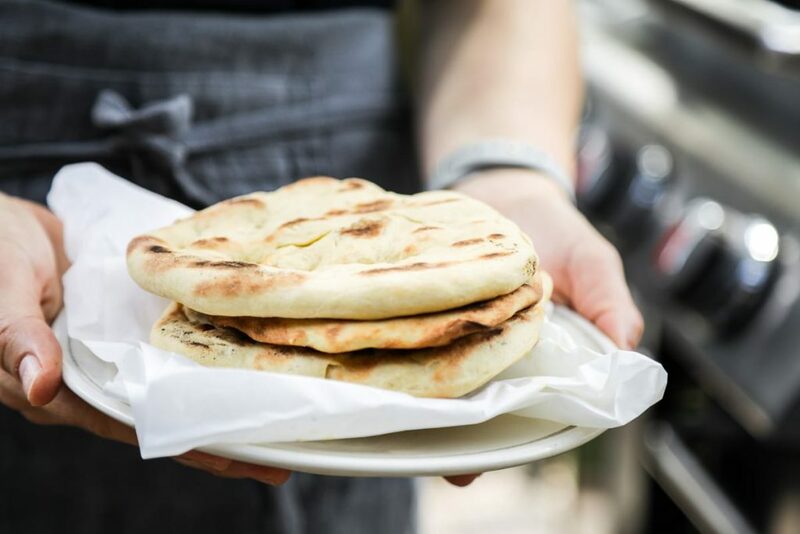 Each grill differs slightly, just like ovens, so keep a close eye on the flatbreads so they don't burn. Remove the flatbreads from the grill. 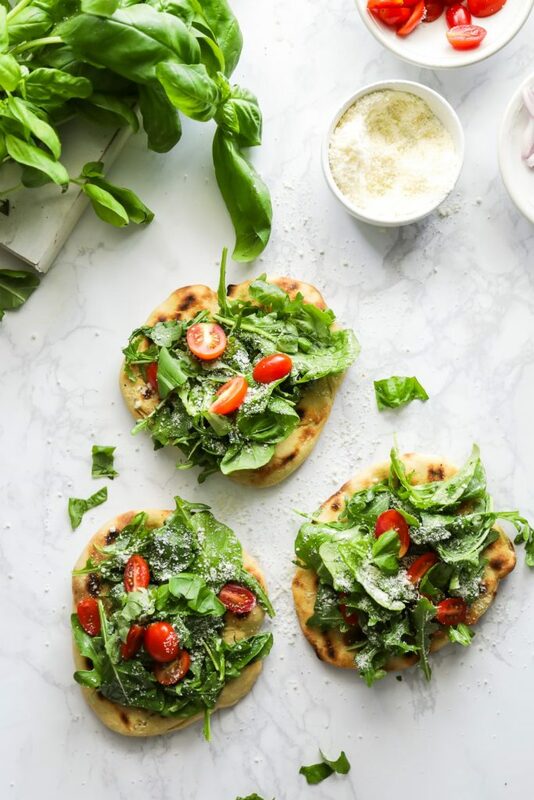 Top the flatbreads with desired toppings (warm marinara sauce, hummus, tzatziki, pesto, crumbled or shredded cheese, salad greens, veggies, and/or cold cut meats). This recipe makes enough dough for 1 large pizza, 2 medium-small pizzas, or 4-6 individual grilled flatbreads. 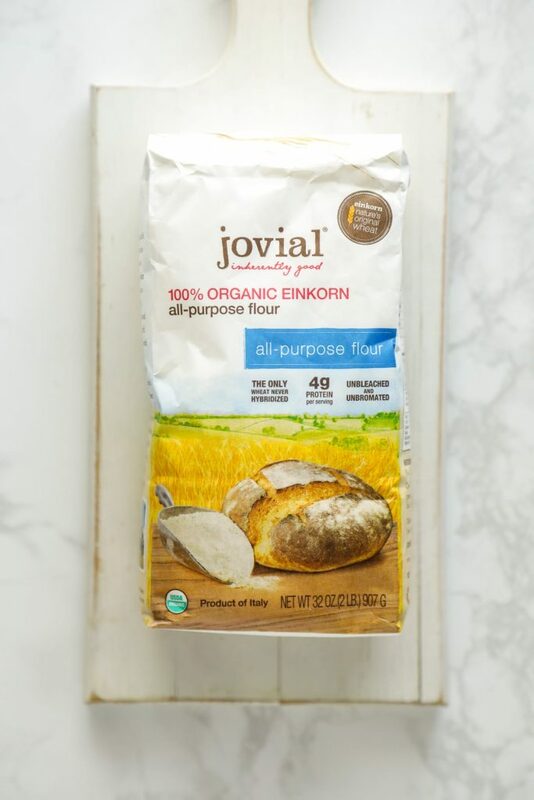 If you'd like to learn more about baking with einkorn flour, I high recommend reading this article from Jovial. I look forward to making this pizza. One question- since I do not have a pizza stone, would a flat sheet pan work? Or what would you suggest? Thank you! Hey Virginia, A sheet pan will work. It won’t produce the same crispy crust, but the pizza should still be delicious! Ohhh, this looks easy and delicious! I can’t wait to try this. Thanks for sharing! Wow this turned out great! We have pizza night every Sunday and even make our own dough, but we’ve always done a basic all purpose white flour dough. This is a wonderful alternative. My whole family loved it…no leftovers! Awesome, Katie! I’m so glad everyone enjoyed it! How much sourdough starter can I use in place of yeast? 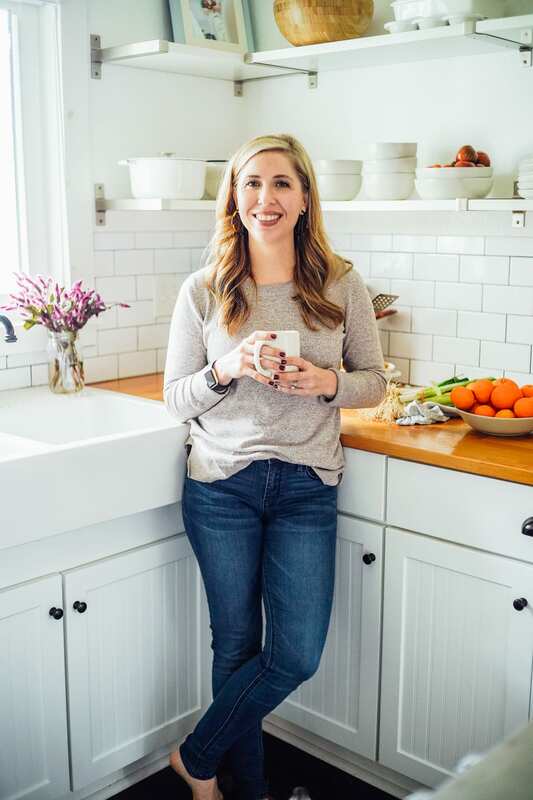 Hey Emily, I used 2 TB in place of the yeast, and used the same method–dissolving it (whisking it) with the water and then adding the remaining ingredients. I ended up only letting my dough rest for about an hour (all the time I had). Next time, I’m going to try 1 TB of starter and let it rest for several hours, just to see what happens. Worked out great!! Your recipe states ” The dough won’t significantly double in size” But it did double in size!! I did let it rest for two hours in the oven that was turned off with only the light on. That was some excellent crust! Thank you so much. Wow, that’s fantastic, Jen! We deal with a lot of humidity where I live, so I wonder if that’s the issue with the dough not doubling in size for me. So glad you loved the crust! I had enough for two pizza’s so I froze half the batch and thawed it out the next week. Worked perfect for a second pizza. Love this recipe. Thanks again. Yay, Jen! I’m so glad you’re enjoying the pizza dough. That was a great idea to freeze the other half! 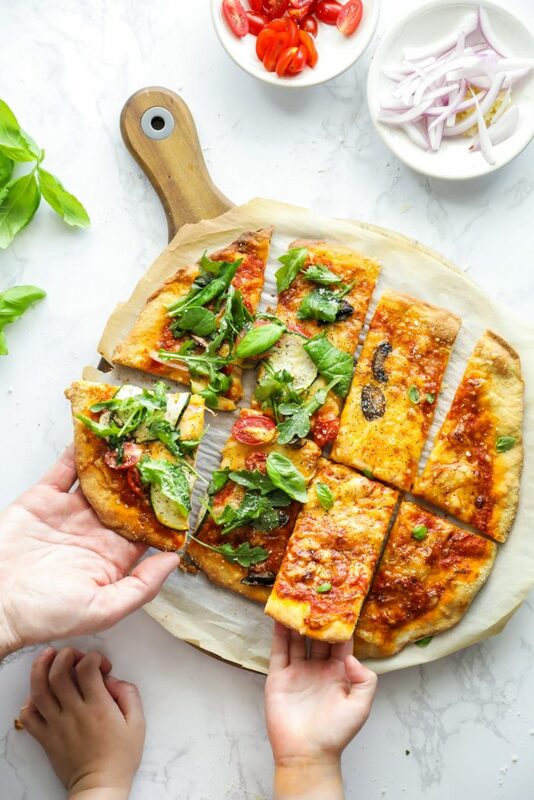 Hi….If I don’t want to make all the pizza dough, can einkorn pizza dough be frozen, then thawed and allowed to rise for baking later? Thank you in advance.